While good sounding audio has existed for a while , the process that goes into making it good has changed greatly. So here is a list of a some helpful tips for the new 2015 Audio Engineer. Many studios and engineers have a lot of options of how to process sound. But because of the recent increase in processing power, flexibility, and cost, people in the modern era are now predominately using plug ins to mix their tracks with. With so much at hand, (especially with with massive bundles like Waves suites), it may be tempting to throw on a plug in that you haven’t used before because you want to try new things. But if you haven’t used it before, it’s ill advised to use it in a song (especially on a clients time) until you know the in’s and outs of the way it operates and sounds. If you want to use something you haven’t used before, take the time off the clock to play around with it a few times, and learn how the plug in sounds. Because each plug in has a unique character with different types of settings, you will need to spend the time to get it to sound good before plopping it on a channel and turning knobs. For example if you never used the Waves C4 before, but heard from a friend that it’s awesome on the mix bus, you will first need to know how that particular plug in works. 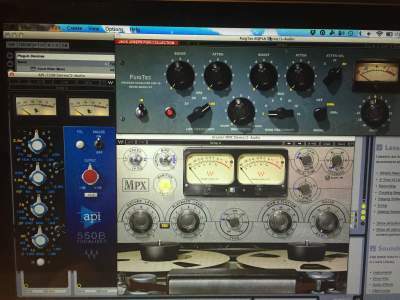 While you may know what multi-band compression is and have used other products, chances are it’s not going to sound the same and will require some time to get to know it. So on the clock, go to what you’ve used before, and in your spare time expand your arsenal of tools by getting to know them well. I read a post a while ago from a guy who was interested in turning off the GUI interface of his plug ins because they were “deceiving” him. And he’s right. It’s very easy to be persuaded by the look of a plug in, rather than the sound. A perfect example is the Waves Puigtec EQ or the Waves Kramer tape simulation. Theres no doubt that they both look cool and emulate very reputable studio gear, but are you choosing to use it for the specific sound or because you subconsciously like the “vintage” look . I can recall a particular scenario a little while back where I pulled up the impressive animated Kramer Tape plug in to get a tape saturated sound on my bass, then went back to it later to find that the basic looking built-in Saturator plug in on Ableton had a sound that was more what the bass needed. Don’t assume it will automatically work for the track just because it looks cool. Always use your ears, not yours eyes! If you are an engineer who is recording music at a studio, it’s probably a good idea to learn about the music your recording right? Seems obvious, but there are countless engineers that don’t know when something sounds off key, or out of time because they are only focused on the way it sounds and not the way it should be played. You should at all times be listening to both. Many engineers have the stance that it’s up to the band or the producer to know what is supposed to be played musically, but when it’s a technical problem, like an off key note or a weirdly shuffled drum hit, it’s up to the engineer to ask the artist to redo a take or fix the problem. After all, at the end of the day, the goal is to create a great sounding song, and it will only go so far if it sounds good but isn’t played right. Your clients will be happy you care. Trust me. The biggest problem when listening to mixes at loud volumes is that for the most part ,everything sounds balanced and as a result, automatically “good”. At loud decibels sound becomes compressed and parts that are quieter are heard more easily, and parts that are loud seem on the same plane as the quiet parts. Also at loud volumes, especially in non absorbant spaces, there can be a lot of reflections that bounce back and impair the accuracy of your perception. Bass builds up and causes strange room nodes, and phase issues and can quickly skew the mix. But, if you mix at low levels it eliminates reflections and the deceiving flattened EQ curve. Spending some time researching the type of music you are recording in advance can help greatly in the session. For example, if you are recording Trap or Drill rap, listen to the big Trap and Drill singles that are out, and take notice to what they are doing. If the artist is still under the radar, chances are they in some way are trying to emulate the sound of the ones who made it big, so you should do your part from an engineering standpoint and know what sound they are going for. When dealing with Rap music for example, things like placement of drops (cutting the beat out), pitch effects, when to use auto tune, stutter vocal effects, telephone filtering are all things that the artist will want , but don’t necessarily know how to explain (or wont be thinking of). If you beat them to the punch, or surprise them with a cool sounding effect, they will show you a lot of respect for really trying to make their song a hit song. If you do these things they will no longer view you as someone who is working for an hourly rate, but someone who is dedicated to their song. You may know that rolling off low frequencies on most tracks that aren’t bass/kick can improve intelligibility in the mix, but what some people don’t think about, is that the same thing applies with high frequencies. Some sounds don’t need to have high end content, especially when it’s fighting with other sounds in the same frequency ranges (vocals, guitars). Putting lowpass filters on certain instruments can make room for other things to come through. In an interview with legendary engineer Chris Lord Alge, he said for a recent song he put a low pass filter on his drum buss so his vocals would come through more. Granted this is a bit out of the ordinary, the point is he’s making space in the high end, instead of just the low end. By the time a song is done it’s going to be compressed various times. For example, the vocal may have a compressor on the individual channel, on the vocal bus, possibly a compressor on the master, then compressed and limited again during mastering. So seeing how there are a lot of stages where the dynamics are getting squashed, make sure you don’t over do any of them, because the end result will be very additive and also very obvious. This may be something you heard before (or something you at least should have figured out by now), but checking your mixes on different playback systems is a good way to judge how your song will translate, and if you made the right decisions. If I have the opportunity, I usually check my mixes on both my laptop and my headphones. The laptop is a good reference to check on, because that’s where a lot of your audience is going to be hearing your songs from. It’s hard to gauge sub bass on a lap top, but you should at least be able to hear the upper harmonics of the bass and kick. And if you can’t hear any bass, theres a good chance it’s sitting too low (spectrum wise) in the mix, or it’s too quiet. For me personally, I also listen on my Sony MDR 7506 headphones because I listen to a lot of great sounding music on them, and know how they are supposed to sound. I know right away if there is too much low end on the song with my headphones, so it’s a good tool to utilize. It’s now 2015, and information is at the tip of your finger tips. The internet is chalk full of useful information, and should be utilized as often as possible! Watch tutorials on how to use a plug in, watch “in the studio” videos, and perhaps most importantly, watch the web series Pensado’s place on Youtube! Link> https://www.youtube.com/user/PensadosPlace .Dave Pensado, an award winning engineer, sits down one on one with some of the greatest and most famed audio engineers of our time, and picks apart their approach and engineering process for mixing and tracking. Another reason why it’s good to watch how other people do things is because it shows you another way how to do things. You may have always been stuck on a certain way of doing something, until you see that there is another way that also works well (if not better.) This is good to know because when something goes wrong, like gear or a plug in suddenly not working, you know another way to do it. My mixing technique has definitely changed over the years and similar to yours, will continue to change. Although I have to say, the one thing that has changed the most about my engineering is my standard of what a “great” mix is. For example, instead of setting things and leaving them, I utilize automation much more to make every section work perfectly (instead of lazily finding a middle ground). I take the time to go through all the components of the track, and make sure they sound good alone, grouped, and as a whole in the context of the mix. So if you have a high standard for what a great mix is, and you have the technical knowledge, there’s no reason why your tracks can’t sound amazing. Unfortunately recognizing great sounding audio verses just good sounding audio is not something that comes easily, and takes a lot of patience and perseverance. Listening to well mixed song on hi fidelity recordings on vinyl or cd (verses poorly represented mp3) will give you a good example of what great recordings sound like. After all you can’t make things sound great, unless you know what “great” is.